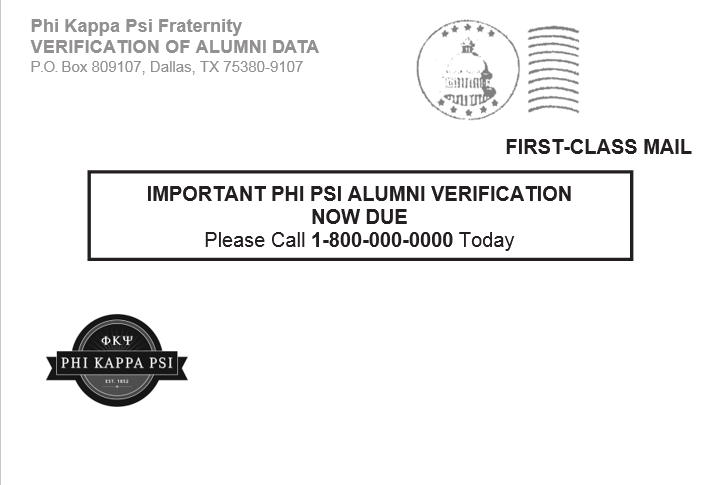 Phi Kappa Psi Fraternity is partnering with Dallas, Texas-based Publishing Concepts, Inc. (PCI) to launch a comprehensive member verification project that will kick off Friday, April 5 and continue through Friday, Oct. 4. Alumni members are encouraged to update their information by calling 1-866-668-5237 beginning April 8. Following the close of the campaign, members can purchase a hard copy of the directory or a CD containing the same information electronically. Purchasing information for the Grand Catalogue will be shared at a later time. 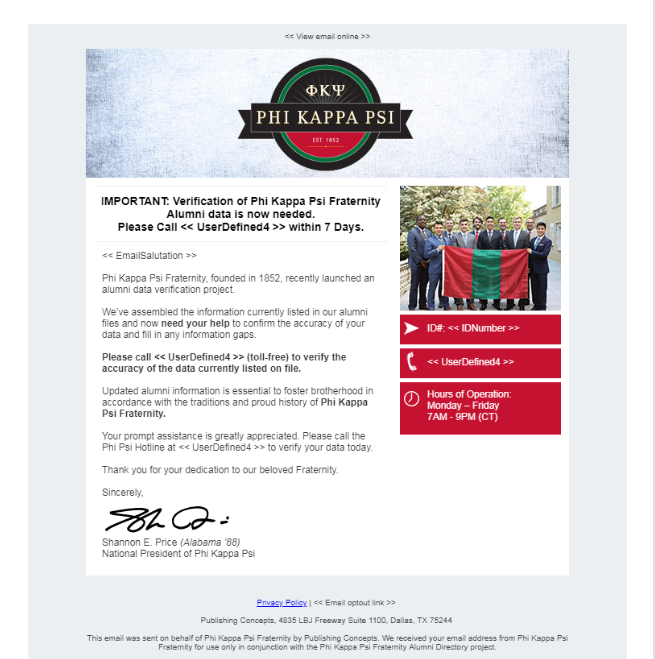 In addition to building member relationships, verified data will be shared with Phi Kappa Psi Headquarters staff so that they may remain in regular contact with all alumni. Phi Kappa Psi Headquarters staff will never share information and member privacy will be strictly adhered to at all times. To complete the data verification process, members will receive a post card via the United States Postal Service and a matching email from PCI prompting them to contact the PCI phone center to make their updates. I received an email/postcard/phone call from a company asking for my personal information. They said they were working on a directory forPhi Kappa Psi Fraternity. Is this a legitimate project, or is it a scam? We have partnered with PCI (also known as Publishing Concepts) to produce our new members directory. PCI is a company located in Dallas, TX and Virginia Beach, VA that publishes directories for educational institutions, fraternities, sororities and military organizations across the nation. This project allows Phi Kappa Psi Fraternity to receive important updates to our database so we know more about our brothers and how we can better serve you and future brothers. a. The names, addresses and information provided to PCI by Phi Kappa Psi Fraternity for the publication of the Directory will be held confidential by PCI, except to the extent that they are utilized in, or in the preparation of, the Directory and except as required by court order or law. b. The Directory will be made available only to members of Phi Kappa Psi Fraternity. Upon completion of the project, PCI will return to Phi Kappa Psi Fraternity any and all electronic files that have been supplied to Phi Kappa Psi Fraternity or produced by PCI in connection with the production of the Directory. If you have received a postcard or an email with a telephone number, you may call the number to speak with a dedicated representative for the Phi Kappa Psi Fraternity project. The representative will verify all the information we have on file for you and make any updates where needed. The Phi Kappa Psi Fraternity Membership Publication is available for sale only to Phi Kappa Psi Fraternity brothers. When you call to update your information, you can tell the representative what information you would prefer to have excluded. You may also communicate this information to the PCI customer service desk (1.800.982.1590) or to the Institution.